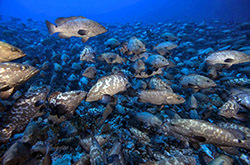 This is an expedition to die for; once a year, Camouflage Groupers come together in a colossal aggregation in the south pass of Fakarava, an atoll in the Tuamotu Archipelago, French Polynseia, to spawn on the day of the full moon. 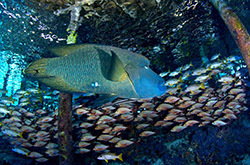 With numbers in some years exceeding 20,000 groupers, biologists believe it to be our ocean biggest known aggregation of large reef fish. 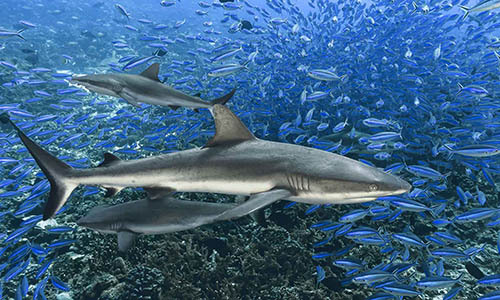 In 2014, Laurent Ballesta and his team recorded over 700 sharks feasting into the spawning sessions. This phenomenon in the blue pristine waters of the South Pacific is found nowhere else in the world. 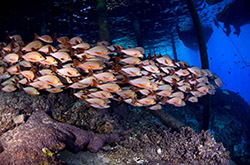 To experience this very special event Ocean Geographic has organised a 2019 trip with this unique itinerary for a 10 day live-aboard expedition to explore the Toau, Faaite, Niau and Raraka atolls, of course the focus is on the spawning aggregation in Fakarava. 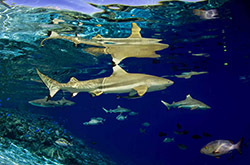 Join Michael AW for this unforgettable sojourn aboard the new French Polynesia Master. It is one of the MOST INCREDIBLE Wildlife events on our planet! 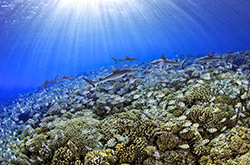 Michael AW will guide you through this expedition offering you the best photographic advice and diving at the best times for an unforgettable sojourn through the atolls. 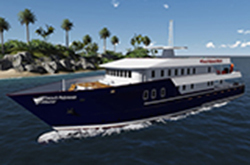 The newest French Polynesia Master is a brand new steel hull luxury live-aboard with lower deck and upper deck cabins, each with en-suite and individual air conditioning units. Communal relaxation areas are split between the middle and upper decks comprising a spacious indoor lounge area, camera set up station and guest storage drawers, with comfortable bench seating and plasma screen. There is an extra shaded outdoor lounging area to the rear of the upper deck with more comfortable seating. Finally, there is a sun deck deck on the upper level with to jacuzzi’s where you can literally soak up the stunning views of the French Polynesian islands. Diving is at the rear of the upper deck in a dedicated shaded outdoor seating area. Dive equipment is set up and stored on the rear of the main deck. Each evening we offer discussion on choice of lens, options of ambient light and strobe settings , composition and exposure for successful images. We advise participants to arrive one day earlier into Papeete. And book domestic flight to Rangiroa to arrive by 9th June. Airport transfers are included. Not Included: National Park Fees, dive rental equipment, alcoholic beverages and gratuity. Lower Deck: USD 6500 per person twin sharing. Upper Deck USD 6880 per person twin sharing Deposit USD 1500.